MYA's new 2018 release, BEYA-129 with the new XFunction technology, comes in a variety of color options to choose from. Addon the new MYA Fornello to complete the hookah with the ultimate and newest hookah technology on the market! MYA's new 2018 release, BEYA-129 with the new XFunction™ technology, comes in a variety of color options to choose from, including the newest bright red which is part of the 2018 curated color collection. You can choose an all-black or all red hookah, mix and match your stem, base, hose and burner color and have the perfect pairing. Every one of our new 2018 BEYA-129 comes packed standard with a matching hose, MYA tongs, the new 390 burner, and MYA etched plate, and solid brass stem (featuring the interchangeable “Pambo” stem cover.) Don’t forget to pick up a carrying case to protect your new investment and be sure to check all the other XFunction hookahs MYA has to offer! With the MYA XFunction Down Stem and the use of your purge valve, your can now get rid of trapped gases along with the harsh, stale smoke from your hookah. 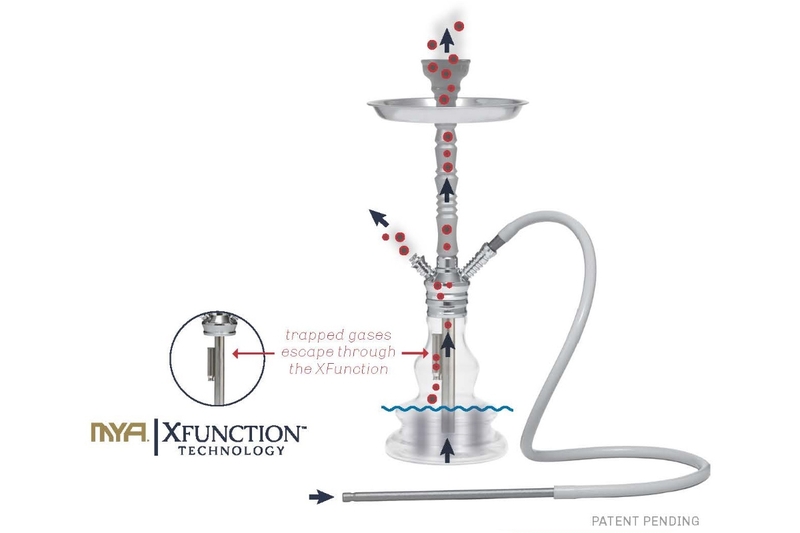 Begin the MYA XFunction by blowing into your hose to automatically purge your hookah through your bowl. Continue to do this as needed. When purching the smoke and gases out of your hookah, you may nee to adjust the purge valve opening to control the amount of smoke/air going out of the top bowl. If the Fornello is not available, controlling the purge valve manually will be essential for making sure you do not end up with an ashy mess from too much air flow.